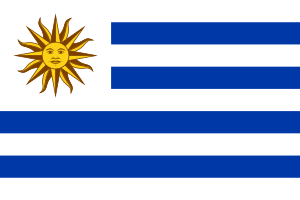 The national flag of Uruguay was created in July 1830. It has a yellow sun on the top-left corner. The flag has nine stripes. Four of them are dark blue and five are white. The original flag had 16 stripes, but it was changed in December 1828. It has a ratio of 2:3. This page was last changed on 29 October 2014, at 20:41.